The present invention relates to a drift tube linear accelerator (linac) for accelerating ions as a beam, a system comprising such a linac and a method for accelerating an ion beam according to the preambles of claims 1 , 8 and 1 1 , respectively. The invention also relates to the application fields of the disclosed linac, system and accelerating method. Existing accelerators are of three kinds: cyclotrons, linacs and synchrotrons. If the request is for ion beams of large mass-over-charge ratio and/or for the velocity range up to about 0.6 times that of light, conventional cyclotrons are less suited. Compactness, modularity, less complexity and as a result lower cost are the advantages of linacs with respect to synchrotrons. The technology of radio frequency (RF) linacs is currently used for the acceleration of charged particles from an "ion source" to the desired energy. For ions (protons and heavier ions), the energy range covered by linacs is of several tens of kilo-electron-volts per nucleon (keV/u) to hundreds of million- electron-volts per nucleon (MeV/u), i.e. a velocity range from about 0.05 to about 0.8 times that of light. Several types of linacs, which are maximally efficient in a particular energy sub-range, have been developed. If a large range has to be covered, different linac structures, each optimally chosen in its frequency range, are serially disposed, with a consequent increased complexity and cost of the whole system. It is well known that a parameter commonly employed in this field is β = v / c, where v is the velocity of the particles and c is the velocity of light. Standing wave linacs are mainly used for particle velocities less than half the speed of light (low β linacs). Both standing wave and travelling wave linacs are used for higher velocities (medium β linacs), with the current trend in favour of the first solution. At v ~ c, travelling wave linacs predominate (high β linacs). It is also known that deep cancer therapy with light ion beams requires β < 0.6, which is in the range of standing wave linacs. - the Coupled Cavity Linac (CCL) structure is the standing wave structure most used in the high velocity range (0.4 < β < 1). In standing wave linacs, the RF electric fields are applied inside evacuated resonant cavities to a linear array of electrodes. The spacing between the electrodes is arranged so that the field in an appropriate phase with respect to the beam arrival delivers "useful" power to the particles. The rest of the time, the field is shielded and does not act on the bunched beam. The spacing between successive electrodes also takes into account the increase in particle velocity, leading to longer structures for higher velocity beams. The RF electric fields in these cavities result from the excitation of resonant electromagnetic cavity modes. Normally, the field pattern is contained in a cylindrical volume. In such a volume, two family modes can exist: transverse magnetic modes (TM), also called E-modes, where a strong electric field component exists along the beam direction (or, in other words, the magnetic field is transversal to the beam direction), transverse electric modes (TE), also called H-modes, where a strong magnetic field component exists along the beam direction (or, in other words, the electric field is transversal to the beam direction). In this latter family, the insertion of the electrodes modifies the field pattern from the just exposed configuration, in such a way that a strong electric field component is always directed along the beam direction, which is the useful direction. Experience in cavities development with both types of standing wave patterns has led to understand the different behaviour of cavities using E-modes or H- modes. Generally speaking, H-mode cavities have quite large effective shunt impedance per unit length, decreasing when the particle velocity increases, while E-mode cavities have the opposite behaviour. Therefore H-mode cavities are more efficient at low velocity, while E-mode cavities are better at high velocity, the crossover usually being placed at around β ~ 0.4. The longitudinal dimensions of the accelerating structure are linked to the length travelled by the particles in an RF period, also called the "particle wavelength" or βλ, where λ is the RF wavelength. Efficient acceleration occurs when the particles arrive at each accelerating gap with the appropriate RF phase. In an RF linac, two working modes are possible: 0-mode and π- mode. Considering the RF field at a given time, in 0-mode the on-axis accelerating field has the same module and sign at each accelerating gap, while in π-mode the electric field changes sign from one gap to the next. The current trend is in favour of the π-mode, since, for the same βλ the effective average field gradient is higher. - in the field of research, the requirement is often for high intensity and high- energy beams for experiments, for instance in high energy physics, or related to nuclear fission, fusion and many other applications. U.S. - A - 5,113,141 discloses a four-fingers RFQ linac structure, which is a H-mode cavity structure, making the attempt to focus and accelerate at the same time low energy beams. The efficiency of this kind of focusing rapidly decreases as β increases. The resulting shunt impedance is low and the resulting coupling between longitudinal and transverse planes complicates the beam transport. U.S. - A - 4,906,896 relates to a disk and washer linac the structure of which makes use of E-modes. At low β the shunt impedance is low. The mechanical construction is complicated. The field stability is rather low since it is perturbed by RF resonances close to the working mode. Accordingly, the main object of the present invention is to provide a new ion beam accelerator, a system containing such an accelerator and also a method for accelerating ion beams able to satisfy the above-mentioned requirements. Another object of the present invention is to use some new as well as some existing components, but exploiting new single and combined functionalities in order that, together, unexpected and surprisingly good results are produced, allowing, among other advantages, an effective reduction in the overall dimensions of the accelerator, which can easily be installed in a clinic or an hospital. Another object of the present invention is the increase of the accelerating gradient, and, as a consequence, the considerable reduction of the accelerator length. Yet another object of this invention is the consistent reduction in electric power consumption, thus reducing the operational cost of the accelerator, or of the structure or of the overall system including the present invention. Still another object of the present invention is the increase of the velocity range up to at least β ~ 0.6 within small dimensions, thus allowing, in case of medical applications, deep cancer therapy. MHz to about 0.8 GHz for high current production for research or other practical applications. Figure 9 and Figure 10 illustrate sections taken along the sectional lines IX-IX and X-X, respectively, of Figure 4, Figure 11 is a partial longitudinal section of a module, showing a middle coupling structure modified for coupling to RF power feeder and part of two accelerating side structures, in a 45° section. In the different figures, the same reference number always refers to the same element. Only the parts necessary for the comprehension of the invention have been illustrated. In the following structural, functional and method description, we refer firstly to Figure 1 , which shows a block diagram of a system or a complete complex K comprising a linac developed according to the present invention and indicated as a whole with 4. Coupled cavity systems have been proposed or designed but none has considered H-type accelerating structures. In the usual techniques H-type structures are typically used at low velocity and low frequency. As indicated before, according to the invention it is on the contrary proposed to use such H- type structures at much higher frequencies. In fact, it is well known that the higher the frequency, the higher the allowable field, with consequent increase of the energy gain per meter and reduction of the overall accelerator length. This parameter is very critical, for instance in medical applications, where the search for reduction of the overall accelerator length is linked to the reduction of costs and installation space. However, the RF accelerating field causes a radial defocusing effect, particularly important at low energy, which limits the maximum allowable field. Therefore, a certain number of radial focusing actions must be added as well, bringing to an overall increase in the whole accelerator length. According to the invention, the transverse focusing is obtained with a well- known technique based on the use of magnetic quadrupoles as focusing elements. The dimensions of said quadrupoles do not scale directly with the frequency. At low frequency the conventional choice is, where possible, the insertion of the quadrupoles inside the accelerating cavities, or, where not possible, the construction of separated cavities alternated by focusing elements. Therefore, according to the invention, a base module is composed by a middle coupling structure 9 and two accelerating side structures 8, said three structures joined together. According to the invention, in the illustrated example the coupling with the RF power generator 11 is done, where necessary (e.g. in a single base module), see Figure 2, through a modified coupling structure 9A. Said coupling structure 9A is similar to said coupling structure 9, where structure 9 is split in two parts, called split coupling cells 21, and a third cell, coaxial, called feeder cell 22, is added. A possible, but not exclusive configuration is shown in Figure 1 1, where a longitudinal 45° bent section comprising the modified coupling structure 9A at the centre and part of two accelerating structures 8 are shown. In this way the π/2 RF configuration is maintained. Now the two split coupling cells 21 are left unexcited by the field, while the feeder cell 22 is excited. Therefore the power is efficiently injected via a waveguide or a coaxial cable into the feeder cell 22 and passes through the two split coupling cells 21 via two or more slots. The length of the so modified coupling structure is such to keep the synchronism with beam acceleration. According to the invention, with the proposed coupling system enough space can be allocated in the central part of the coupling structure 9, 9A to insert one or more quadrupoles 18 for the transverse focusing. The space needed for the coupling structure is therefore advantageously used also for beam transverse focusing, obtaining in such way the maximum compactness of the whole CLUSTER 4. It is pointed out here that the quadrupoles 18 could also be substituted with other functionally equivalent components, in case placed also out of the coupling structures 9,9A an that, in particular embodiments, said quadrupoles 18 could also be omitted. Therefore, according to the present invention in a simple embodiment a single RF power generator 11 can power a module 7 or 7 A of the CLUSTER 4, while, if several associated modules 7 and/or 7A are foreseen, also can be foreseen several single power generators 11, with a single RF output 12 or with multiple, tree-type output 12, where with 12 we define also the RF input entries in the modified coupling structures 9 A of modules 7, 7 A foreseen. According to the invention each module has a single RF input 1 1 on a single modified coupling structure 9A. As can be seen from the Figures, a series of drift tubes 15, distributed along the longitudinal axis of the CLUSTER 4 is located in the accelerating structures 8. A number of m thin radial stems 16, 17 with m > 1, support, from the internal surface of the tank wall of the accelerating structures 8, each said drift tube 15. The resonant working mode of the accelerating cavities can be classified as an Hm)o mode. In the shown preferred embodiment m = 2 and the stems 16, 17 are alternately horizontal 16 and vertical 17. H-modes have the magnetic field disposed longitudinally along the cavity, while the electric field is radial, except on the axis where the drift tubes 15 introduce a distortion of the electric field along the beam direction F. Figures 7 and 8 present respectively a transverse section of the accelerating structure 8 along the sectional line VTI-VII and VIII- VIII of Figure 4 and show, according to usual conventions, the direction of the H field. It is well known that, for an efficient acceleration, the on axis electric field should be approximately constant along the whole structure. This is not the case for the H-modes in a perfect cylindrical cavity, because the magnetic field has a maximum in the centre and a zero at the extremities of the cavity, and this brings to zero the on axis electric field at the extremities. Some mechanical and structural modifications have therefore been added according to the invention at the terminations of the accelerating structures 8, and also at the coupling terminations 10 between accelerating structures 8 and interposed coupling structure 9, 9A to extend in the appropriate way the magnetic field lines, in order to keep roughly the same value of the electric field at each accelerating gap 20. Said terminations 10 have the additional purpose to adjust the coupling between accelerating structures 8 and the interposed coupling structure 9, 9A. To the first purpose, the length and the diameter of said terminations 10 of the accelerating structures 8 are adjusted in such a way to extend the longitudinal H-field lines close to the end caps of said accelerating structure 8. The diameter of the coupling structure 9, 9 A is about twice the one of the accelerating structure 8, therefore the cylindrical terminations 10 have the shape of an annular chamber of intermediate diameter. To the second purpose, the thickness of said terminations 10, the thickness between the coupling structure 9, 9A and the terminations 10, and also the number, shape and dimensions of the coupling slots 14, are adjusted, Figures 3, 4, 5, 6 and 11. Said terminations 10 having the shape of annular chambers are open on a circumference corresponding to their inner diameter, while on their outer surface present coupling apertures 14, Figures 6, 9 and 11. Back to the accelerating structures 8, said structures can be described as an oscillating circuit that can be visualised considering for simplicity the capacitive part concentrated in the accelerating gaps 20 created between neighbour drift tubes 15, and the inductive part distributed in the remaining volume between the stems 16, 17 and the internal cavity wall, Figures 7 and 8. In an RF period, the path of the RF current from a drift tube 15 to the neighbour passes back and forth through a horizontal 16 and the vertical neighbours stems 17. Since the ratio α>ι / ω0 must not be less than a few per mil, a maximum of about 20 accelerating gaps 20 per accelerating structure 8 has been accepted. As already mentioned, a fundamental teaching of the present invention consists in the use of a conventional H-type structure (i.e. a structure typically working at some hundreds of MHz according to conventional structures), that is made to work at high frequency, for instance, as indicated before, for deep cancer therapy. 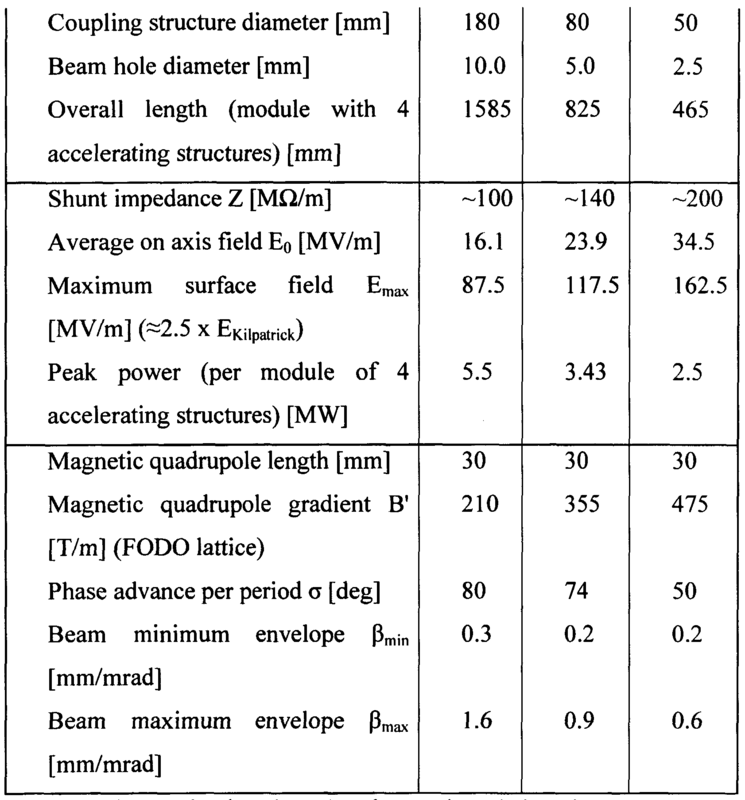 On the contrary, according to the present invention, and as can be found from the following Table 1 , the length of the accelerating structures 8 does not exceed about 350 mm, reached at about β = 0.6, and the diameter does not exceed about 100 mm. Since the accelerating gap length 20 decreases linearly with the frequency, while the maximum field that can be applied (according to a criterion established experimentally by Kilpatrick in 1953) increases only with about the square root of the frequency, the length of the structure for the same energy gain decreases roughly as the square root of the frequency, but more accelerating gaps 20 are required. Moreover, direct coupling of a power line to such a small diameter structure would be extremely difficult to design, since it would be impossible to avoid severe distortions in the accelerating field. The small transverse dimensions also avoid the possibility to insert magnetic quadrupoles as focusing lenses inside the structure, as often done in the conventional cavities working at low frequency. As explained before, these problems are efficiently solved by the novel technical and structural design of the CLUSTER 4, comprising base modules 7 and extended modules 7A. The basic structure, see for example Fig.2, comprises two accelerating structures and one coupling structure. In the presented embodiment, according to the invention, the quadrupoles 18, arranged inside every coupling structure 9, 9A, ensure the beam transverse focusing in the FODO lattice configuration. In practice, commercially available permanent quadrupole magnets 18 of 30 mm longitudinal length and a few mm bore radius can be used. Magnetic gradients of dB/dx ~ 500 T/m can be achieved. Table 1 summarizes three examples of possible CLUSTER 4 modules, working at different frequencies: 1.5,3.0 and 6.0 GHz. In these examples 12C6+ (Q = 6, A = 12) is the accelerated particle. 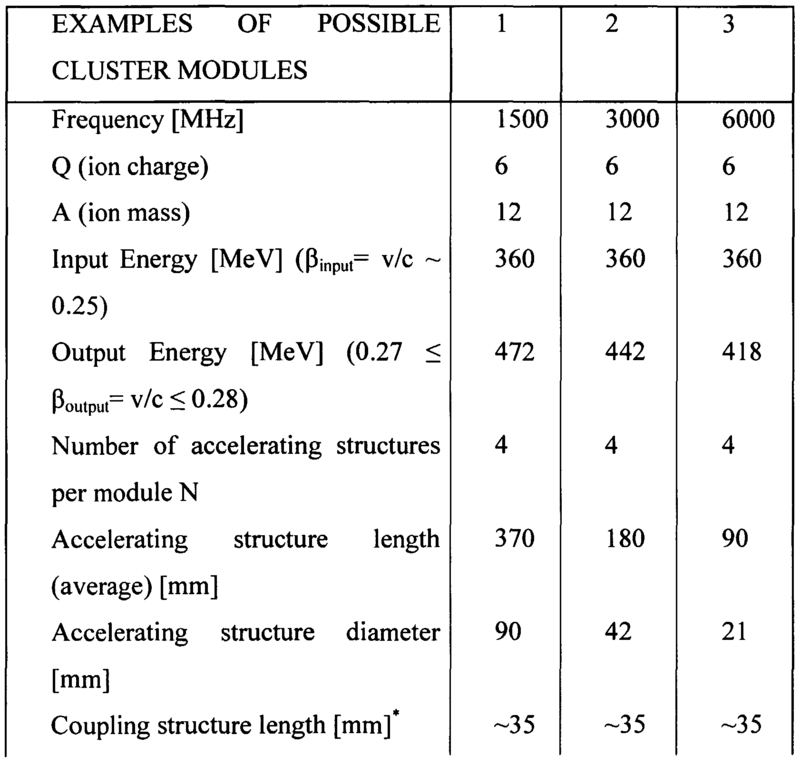 Table 1 Examples of possible CLUSTER modules to accelerate ,2C6+ (Q = 6, A = 12). From the above structural and functional description it is inferable that linacs according to the invention achieve efficiently the scope and advantages indicated and can be advantageously used in a large variety of fields, from the medical one, over which the inventors based the exposed example, to research or many other applications, for instance in high beam current production, in fission and fusion applications, and also where the use of superconducting accelerators is foreseen, and so on. An important aspect of the present invention consists in the fact that such a linac or a CLUSTER according to the invention can also efficiently work at lower frequencies than the ones indicated. In fact, by appropriately reduction of the working frequency, for instance working with frequency of the order of 100 MHz to 0.5 GHz, it is possible to obtain higher currents, as required in many research fields. Therefore, the scope of the present invention includes all CLUSTER structures according to the invention irrespective of the number of the provided base and/or extended modules, wherein the suggested CLUSTER can work at high as well as low frequency, as indicated above. Those skilled in the field may introduce technically and functionally equivalent modifications in the design of linacs and CLUSTER according to the invention for various applications without departing from the scope and spirit of the present invention as defined in the accompanying claims. - P.M. Lapostolle, "Introduction a la Theorie des Accelerateurs Lineaires", CERN 87-09 Division du Synchrotron a Protons, Juillet 1987. - T. P. Wangler, "Introduction to Linear Accelerators", Los Alamos National Laboratories Report LA-UR-93-805, April 1993. - U. Ratzinger, "Effiziente Hochfrequenz-Linearbeschleuniger fur leichte und schwere Ionen", Habilitationsschrift, Fachbereich Physik der Johann Wolfgang Goethe Universitat, Frankfurt am Main, Juli 1998. - U. Amaldi, A Possible Scheme to Obtain e-e- and e+e- Collisions at Energies of Hundreds of GeV, Phys. Lett. Vol. 61B, Nr.3, pp.313-5, March 1976. - U. Amaldi, M. Grandolfo, and L. Picardi editors, "The RITA Network and the Design of Compact Proton Accelerators", INFN-LNF Frascati, Italy, August 1996 (ISBN 88-86409- 08-7). - M. Crescenti and 2 co-authors, "Commissioning and Experience in Stripping, Filtering and Measuring the 4.2 MeV/u Lead Ion Beam at CERN Linac3", Linac96, Geneva, Switzerland, August 1996. - R. Zennaro and 2 co-authors, "Equivalent Lumped Circuit Study for the Field Stabilization of a Long 4- Vane RFQ", Linac98, Chicago August 1998. - M. Crescenti and 8 co-authors, "Proton-Ion Medical Machine Study (PIMMS) PART I", CERN/PS 99-010 (Dl), Geneva, Switzerland, March 1999. - U.Amaldi, R. Zennaro and 14 co-authors, "Study, Construction and Test of a 3 GHz Proton Linac Booster (LIBO) for Cancer Therapy", EPAC2000, Vienna, Austria, June 2000. - U. Amaldi, R. Zennaro and 13 co-authors, "Successful High Power Test of a Proton Linac Booster (LIBO) Prototype for Hadrontherapy", PAC2000, Chicago, August 2000. - M. Crescenti and 13 co-authors, "Proton-Ion Medical Machine Study (PIMMS) PART II", CERN/PS 2000-007 (DR), Geneva, Switzerland, July 2000. In particular: Chapter II-7 Injection. 1. Linac for ion beam acceleration, characterised by the fact of comprising: i) at least one couple of a first and a second accelerating structure (8) aligned on the same axis, resonating on a H-type standing wave electromagnetic field, each one housing a plurality of coaxial drift tubes (15), supported by stems and reciprocally separated to form a respective gap (20) accelerating the ion beam, where the external extremity (8A) of said first accelerating structure is the input of the pre-accelerated, collimated and focused ion beam, and the external extremity (8B) is the output of the higher energy ion beam, ii) an interposed coupling structure (9), or if necessary a modified coupling structure (9 A) to be connected to an RF power generator (11), acting as a bridge for the RF power flow between adjacent accelerating structures (8), coaxial, resonating in a standing wave TEM-type cavity mode, composed of two coaxial cylinders, if necessary linked to a vacuum system (13) and including, if necessary, one or more quadrupoles (18), whose length is appropriate to maintain synchronism of the acceleration, being linked to said first and second accelerating structures (8), with their respective internal extremity (8C) through annular terminations (10), present at both extremities of said accelerating structures (8) and allowing the regulation of the electromagnetic field on the axis of each said accelerating gap (20), iii) wherein the working frequency is superior to 100 MHz. 2. Linac according to claim 1, characterised by the fact that inside said accelerating structures (8) said drift tubes (15) are supported by m > 1 thin radial stems (16,17) reciprocally rotated on a circumference of π / m.
4. Linac according to claim 1, characterised by the fact that the base module (7), composed of said first and second accelerating structures (8) and of said interposed coupling structure (9A), connected to an RF power generator (11), and if necessary equipped with one or more quadrupoles ( 18), is foreseen to be modularly extended to form extended modules (7A) comprising an always odd number n of coupling structures (9, 9A), if necessary equipped with one or more quadrupoles (18), and a number N = n + 1 of accelerating structures (8). 5. Linac according to claim 1, characterised by the fact that the length of said drift tubes (15) and of said accelerating gaps (20) increases so that the distance between the centres of neighbouring said accelerating gaps (20) is about an integer multiple of the particle half wavelength (βλ / 2). 7. Linac according to claim 1, characterised by the fact that each base module (7), or each said extended module (7 A), forms a series of coupled resonators oscillating in the π 12 mode. 9. Linac according to claim 1, characterised by the fact that the working frequency is in the range 100 MHz - 0.8 GHz. - furthermore at the linac (4) output, the accelerated ion beam is if necessary steered in a higher energy beam transport line (5) in the area or to the device (6) where it is to be used. 5. Use of a linac or a system comprising a linac according to one or more of claims 1 to 10 for the production of average beam currents superior to 10 μA for research and related applications.